Mangaluru, Dec. 12, 2015: District Congress Committee president and District Incharge minister B.Ramanatha Rai called an emergency meeting of Party workers on Friday night to pacify party workers in an attempt to garner support for the party’s official candidate Pratap Chandra Shetty. Four rebel candidates of the ruling Congress party from Coastal Karnataka has been declined to withdraw from the fray despite frantic efforts by party leaders as Saturday was the last day for withdrawal of nominations for polls to the Legislative Council from local body institutions. This emergency meeting was held on Friday night at 8.30 pm in the District Congress Committe office here in the city. B.Ramanatha rai presided over the function and attended by Former Union Minister Oscar Fernandis, Urban Development Minister Vinay Kumar Sorake, MLA JR Lobo and Moideen bava, MLC Ivan D’ souza, six corporators and others. The leader’s who spoke in the meeting stressed need to support and work hard for the victory of party’s official candidate and tried to pacify the allegation of wrong choice of candidate for the MLC poll from Dakshina Kannada – Udupi constituency. Sources in the state unit of Congress said senior leaders have arrived at a consensus to expel these rebels – one in Bengluru (Urban) and three in Udupi-Dakshina Kannada – if they do not fall in line on Saturday. In fact, the leaders have already warned these rebels of tough action in the form of expulsion. Meanwhile, the leaders asked one candidate in Hubbali-Dharwad to withdraw from contest at the 11th-hour because they were apprehensive that the party would not be able to pull off victory in both constituencies. This was the lone district where the party issued two “B” forms unlike four other districts where the leaders chose to field single candidates. Former minister K. Jayaprakash Hegde, Udupi DCC president Bhujanga Shetty, and Billava strongman Harikrishna Bantwala are refused to withdraw their nomination papers for the poll. 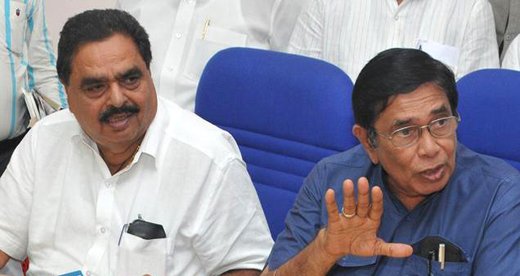 It is said to be an embarrassment for the party because veterans like Oscar Fernandes, B Janardhan Poojary and M. Veerappa Moily started their political career from this coastal belt and this trio is very close to top brass in Delhi. All the rebels have put forth a single demand that the party should not field sitting MLC Pratapchandra Shetty, who happens to be a staunch supporter of Mr Fernandes in Udupi district.